U.S. Intel Officials On Edge As They Watch Egypt U.S. intelligence officials say that Egypt may move "in the right direction" — but that change could also destabilize a region vital to U.S. interests. Several Middle East countries have conditions similar to those that led to Egypt's popular uprising. Last January, CIA Director Leon Panetta (left) met with Egyptian President Hosni Mubarak at the presidential palace in Cairo. News that Egypt's President Hosni Mubarak is under intensifying pressure to step down has top U.S. intelligence officials on edge. In testimony on Capitol Hill Thursday, Director of National Intelligence James Clapper said the protests are "potentially a great opportunity to move Egypt in the right direction." But he and others said they were also concerned that change in Egypt could yet prove to be destabilizing in a region vital to U.S. interests. CIA Director Leon Panetta quickly got the attention of the House Intelligence Committee this morning, when he said there was a "strong likelihood" Mubarak would give up power within hours. 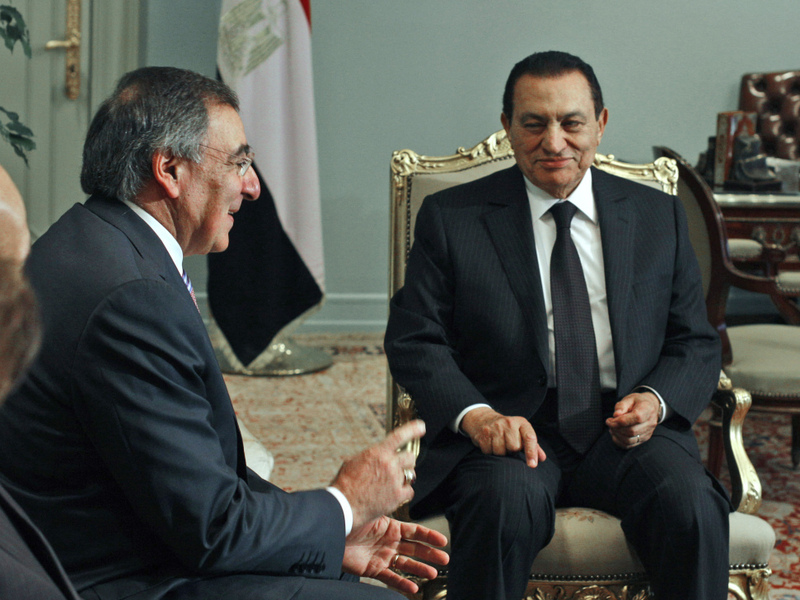 As it turned out, Mubarak did not resign, but he did hand over powers to his vice president. Panetta and other top intelligence officials were delivering their annual assessment of the top security threats facing the nation, but much of the day's discussion focused on what the end of Mubarak's rule — when it comes — might mean. Panetta wouldn't be pinned down, saying only that a political transition in Egypt would have "tremendous impact" one way or another. "If it's done right, it will help us a great deal in trying to promote stability in that part of the world," he said. "If it happens wrong, it could create some serious problems for us, and for the rest of the world." Clapper said that the Egyptian people's attempt to bring about peaceful change offered what he called a "counternarrative" to al-Qaida propaganda — it doesn't fit the al-Qaida idea that corrupt governments must be attacked through violence. But, Panetta said, uprisings are "unpredictable," with no way to know whether leaders "will make the right decisions at the right moments." Democrat Jan Schakowsky wanted to know what the events in Egypt would mean for specific countries — including America's top ally in the region. "Have you done any particular analysis of what the changes would mean to Israel?" she asked. "Yes, we have," Panetta said. "And we'd be happy to share that with you in another forum." But Panetta wouldn't say more publicly about what exactly the CIA has concluded about the impact on Israel. As for other countries, the intelligence officials said the protests in Tunisia and Egypt have helped them understand what may lie in store for others in the region. Panetta said several of them share the conditions that gave rise to all these protests: a lack of political freedom; economic stagnation; and high youth unemployment. "I think all of those factors are at play in a number of nations across that region — all of which means we've got to pay a great deal of attention," Panetta said, "because I think the triggers, the factors that kicked off what happened in Egypt, could very well impact in other areas." Clapper zeroed in on one country, Yemen, and the challenges facing the government of President Ali Abdullah Saleh. "He has secessionists in his own country, the presence of al-Qaida, and he's another leader who's been in place for a long time," Clapper said. But Clapper also noted that Saleh has been a key U.S. ally in the fight against al-Qaida. And at today's intelligence hearing, it was that group — al-Qaida in Yemen — that was portrayed as the top terrorist threat right now. So whether the U.S. government would welcome the toppling of Saleh's government is hardly clear, just as it's uncertain whether a chain reaction of popular uprisings in the Middle East would really be seen as good news.